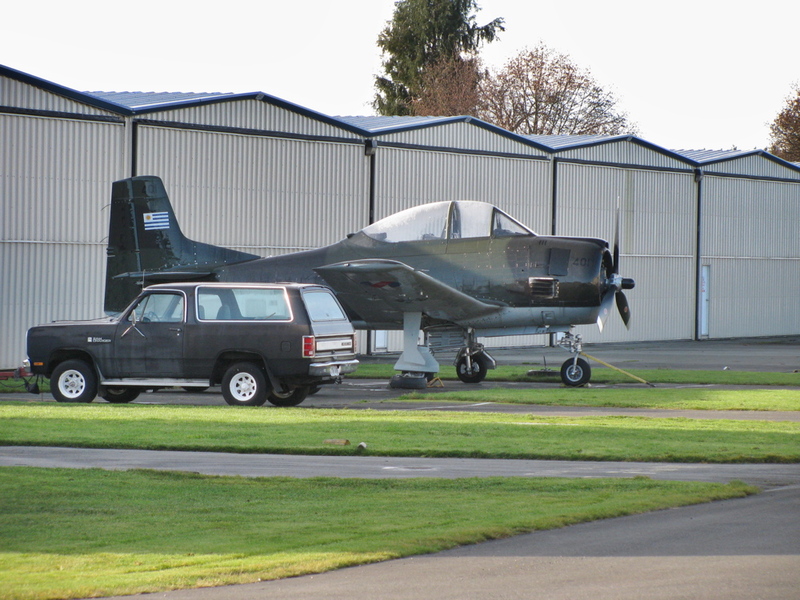 East end of the airport (flying club, Viking Air, VIH etc) sits this T-28. There is an unpainted, bare aluminium beauty inside another hanger. I have heard rumours of 3, maybe 4 on the Island. Not a very good picture, there is a fence keeping me out. This entry was posted on December 17, 2010, 12:53 pm and is filed under aircraft, around the airport. You can follow any responses to this entry through RSS 2.0. You can leave a response, or trackback from your own site. Note the Uruguayan national flag on the tail. This bird must have an intestesting tale to tell. Well spotted, I’ll ask around and see if I can find out what the story is. There is at least one more T28 in those hangers, in US Navy colours, I have a pic of that somewhere on the blog. There is a jet trainer in one of those hangers also, haven’t been able to snap a pic yet. Oh those lucky owners.